Earlier this year I reviewed several iPhone cases from Burkley leathers. Both were very well done…handcrafted from full grain leather and perfectly fitted for my iPhone. 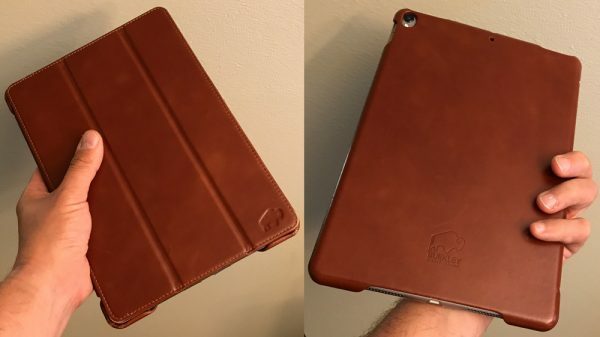 In similar fashion, Burkley has created a Smart Folio cover for Apple’s recently released 10.5″ iPad Pro, also handcrafted with old world style and nicely fitted for the iPad. For this review, Burkley sent one in coffee brown to check out. 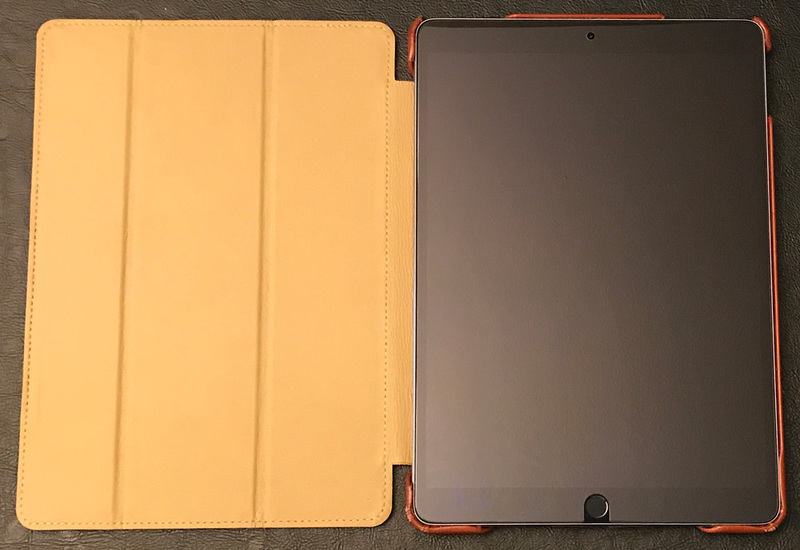 Burkley begins with a relatively thin, minimalistic, plastic shell that holds the 10.5″ iPad Pro securely in place. Burkley surrounds/covers the shell with top-quality cowhide leather both inside and out. According to Burkley, “Each case is individually handcrafted from the finest premium leather with a focus on preserving the leather’s unique characteristics. Each piece of natural leather has its own veins and pores”. The leather is soft and supple with a very nice feel to it and smelled great right out of the box. In addition to top quality materials, the stitching and finish are excellent as well. The Burkley 10.5″ iPad Pro Smart Folio case is perfectly form-fitted for Apple’s latest & greatest tablet. This cover is a slightly padded book-/folio-style case with embedded magnets that work with the iPad’s sleep function to turn the screen on and off when opened and closed. The back has cutouts for the iPad’s rear facing camera and microphone. Both the front and back are embossed with the Burkley buffalo logo. The Folio’s inner lining is made of a tan microfiber leather which is waterproof and dirt resistant. The corners and a majority of the right and top sides wrap around the edges of the iPad. When closed the case covers and protects approximately 95% (aka most) of the device. The top has cutouts for the power button, both speakers, mic, and audio plug. The Folio’s smart cover is hinged on the left side of the case. The base of the case has a large cutout allowing access to the iPad’s lighting port and speakers. The right side has a smaller cutout for the iPad’s volume buttons. Overall, the case provides solid protection from bumps, scrapes, and minor falls both open and closed. Though probably wouldn’t provide all that much protection if dropped on a corner from any real height. As you can see, the front cover is hinged and can fold backwards to support your iPad for hands-free viewing. The front cover can also support your iPad at a lower angle for typing. Both orientations provide a solid base to use your tablet. 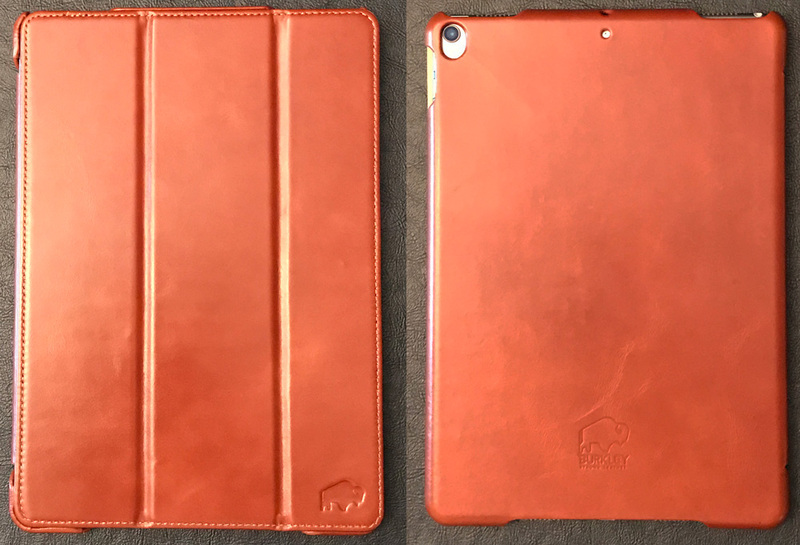 The Burkley Smart Folio Cover for the 10.5″ iPad Pro isn’t just a pretty face. Handcrafted with high-quality leathers with old world style and craftsmanship, that protects and is functional as well…just what you would expect from an upper-end iPad accessory. Other than being a bit pricey, I have only positive things to about this Burkley case. Well worth the consideration if you’re looking for a quality minimalistic smart case for your Apple tablet. Source: The samples for this review were provided by Burkley. Please visit their site for more information and visit Amazon to order.